Home > Untagged TN Regularisation and Unapproved Plot Rules, 2017 - In Chennai City pay Rs. 41,000 for 1,000 sq. ft as plots of Land Regularisation Fee..! TN Regularisation and Unapproved Plot Rules, 2017 - In Chennai City pay Rs. 41,000 for 1,000 sq. ft as plots of Land Regularisation Fee..! In Chennai City pay Rs. 41,000 for 1,000 sq. ft as plots of Land Regularisation Fee..! Do you own an unapproved plots of land measuring 1,000 square feet in a municipal area? Now you can regularise the property by shelling out Rs. 41,000 under a regularisation scheme announced by the Tamilnadu state government on 2017, May 5. Besides this, applicants will also have to pay plots of land use conversion charges of 3% of the market value. The Tamil Nadu Regularisation and Unapproved Layout and Plot Rules, 2017 notified by the Tamilnadu government on 2017, May 5. mandates individual owners and layout promoters to apply for regularisation, failing which their properties may have to go without power connection, water supply, drainage and sewerage facilities. The notified rules were filed in Madras high court on 2017, May 5. as the connected batch of cases is listed for special hearing on 2017, May 12. The rules, expected to benefit about 13 lakh unapproved plots spread across 26,000 layouts, specifies the regularisation and reservation charges for unapproved plots. Accordingly, Rs. 10 square feet would be collected as regularisation charge, while Rs. 70 would be levied as development charges for plots falling under the city municipal corporations. 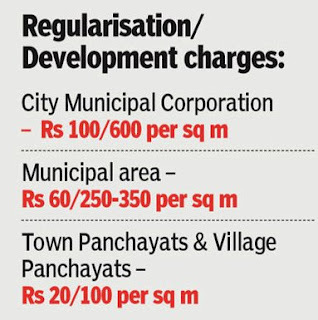 While the collective development and regularisation charges for every square foot in municipal areas range between Rs. 31 and Rs. 41, it is Rs. 18 for town panchayats and Rs. 13 for village panchayats. Moreover, only those unapproved plots registered before October 20, 2016 are eligible for regularisation as the government has prescribed a "cut-off" date. Section 22(A) of the Town and Country Planning Act, which was notified on October 20, 2016, allowed registration of plots, if it was registered under the category of `housing site' at least once in the past. The Act further allows regularisation of unsold plots that forms part of a layout, in the event a portion of the larger layout was sold through a registered sale deed as on the cut-off date. If adequate land is not earmarked for Open Space Reservation (OSR), equivalent guideline value should be collected for the shortage area. "It shall be compulsory for all individual plot owners and layout promoters to file an application to the competent authority concerned within six months from the date of commencement of these rules," the rules said. However, unauthorised plots and layouts located in water bodies, government `poramboke' land, area reserved for OSR, vacant plots blocking access to surrounding plots and few other can not be regularised. "No plot or / layout in part or / whole, lying in the lands below the alignment of high tension and extra high voltage electric line shall be regularised," the rules said. The notification also states that regularization move was taken keeping in view various reasons including the interest of innocent purchasers, who bought such (unapproved) plots. The high court had imposed a blanket ban on registering plots lacking statutory approvals on September 9, 2016 after noticing rampant conversion of agricultural land into residential plots across the state. This had hit the revenue generated through registrations, which saw a fall to the tune of Rs. 300 crore a month after the court's order.